4 - 5,5..........Chico von Forell. Papin Amatzon was the winner of the all breeds Finnish IPO Championship in 1992 with 298 points and tested clear for PHTVL / PHPV and CAH. He lived to 11 years of age and died from cancer. 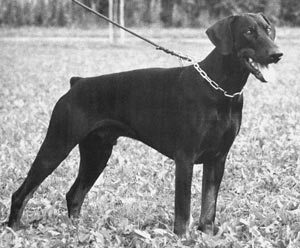 His sire, Cäsar von der Klingenstadt, passed the Swedish Körung and came from the same combination that produced the legendary von der Weyermühle “A” litter (Bingo von Ellendonk x Cona von Niederkassel).